Located 27km north east of Cadiz within Andalucia it is a centre of equestrianism and flamenco and is best known for giving its name to sherry, one of the most popular drinks in the world. Jerez offers a wide selection of bars and restaurants and a wonderful shopping experience in the main street, Calle Larga. The streets and walkways of Jerez are lined with orange trees and on every street corner you will see stacks of oak barrels representing the history of the city. In one of the main squares stands a statue, surrounded by tapas bars where you can sit and enjoy the sunshine, watching life go by. In this square is a regular book fair selling every book imaginable. The Public College of San Miguel de Cervantes stands on the right, a dominant building. 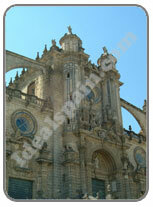 The church in Plaza de San Miguel is worthy of a visit as it towers above you. The Royal Andalucian School of Equestrian Art is worth a visit with one of their popular horse displays. The school is located on Avenida Duque de Abrantes, to the north of the centre of town. Next door is the Sandeman bodega which welcomes visitors. (Tel 956 312 995 or Email). Jerez' importance in the equestrian world is evident by the number of bronze statures in the town. Within Jerez, you must visit the restored 11th century Alcazar and Arab Baths. The Alcazar is open from 10am-6pm. The Alcazar has a superb octagonal tower (Torre Octogonal). There is a wonderful Archaeological Museum in the Plaza del Mercado. The museum is open every day except Mondays. Opening hours are 10-2 and 4-7 on Tuesday-Friday and 10-2.30 at weekends and on holidays. The museum is best known for the Greek helmet and the Bronze Age stone sculpture that are on display. Jerez also has an interesting clock museum, the Palace of Time. It is located in La Atalaya Exhibition Centre. There are more than 300 time pieces on display. It also includes splendid gardens. Entry to the museum is approx. 5€. The Flamenco Museum is located in Plaza de San Juan and is the most important museum of its kind anywhere. Despite all the new attractions the town has developed for modern society, the town has retained its charm and beauty and has preserved its history. There are many monuments worth visiting, not least of all the Baroque Cathedral with its magnificent towers. The cathedral was built in 1700 on the ruins of an old mosque. It was built by the two brothers, Diaz de los Reyes in Seville style. The cathedral houses several important works of art. Jerez has more than its share of churches, all monuments to time and tradition along with a good handful of palaces. The Convento de Santa Domingo was founded by Alfonso X after his conquest of the city. The church originally only had one nave but a second was added to make extra space for the worsjippers that came here to pray to the Virgen de la Consolacion, the traditional patron of Jerez. The church today looks rather unusual, having two naves, each with its own access door. The mix of styles is also evident, Gothic alongside Romanesque. The Palacio Domecq is considered the best Baroque palace in Jerez. It was built in 1775 by the Marques de Montana and is presently owned by the Domecq family. Having two floors, it is constructed around a central courtyard which is supported by marble columns. The most attractive part outside is the doorway with its unique ornamentation. The Plaza Rafael Rivero is one of the quaintest corners of old Jerez. The plaza is lined with neo-classical mansions including that of Don Pedro Domecq de la Riva at number 1. In the centre of the plaza is a bust of Rafael Rivero, Mayor of Jerez in the 19th century. The Plaza de Plateros is the commercial centre of the old town and worthy of a visit. There are tiny streets leading in all directions, each with splendid buildings on both sides. It seems wherever you go in Jerez, the architecture is superb. The motor racing track (Circuito de Jerez) is now a major attraction to Jerez, especially at the time of the world championships when hundreds of thousands of motorbikes enter the town. Speed and agility events are staged in the streets all night. For tickets Tel 956 151 103 or email taquilla@circuitodejerez.com. The circuit is located on the N382 Jerez-Arcos road at km6.5, (10km from Jerez). The children will love to see the zoo which has a wide selection of well cared for animals. The zoo (Parque Zoologico) is to be found east of the town centre and is open from 10am - 6pm. Closed on Mondays. Jerez is a very interesting place to visit that offers something for everyone, will keep you very busy and makes an ideal base for a weekend stop-over or a full week's sight-seeing holiday. The best way to see Jerez is by open-top tour bus; cheap and reliable. For thousands of years, Jerez has been the centre for sherry and brandy production and as such, here you will find the bodegas of the top names in the sherry world. Most allow visits to the bodegas, One such bodega was visited by the Idealspain team in May 2003; the Gonzalez Byass bodega, home of Tio Pepe. We are not sure if this is typical of the bodega visits, however, our opinion is that although it was an interesting tour, it was over-priced (considering the amount of money the company makes anyway), it was rushed and was not suitable for children as there was nothing for them to do. The tour cost 7€ per person. Guided tours take place just a few times each day, in various languages. As with everywhere in Spain, Jerez has a fair share of fiestas, one of the most popular being the Horse Feria (La Feria del Caballo). This takes place in May and features taming and riding competitions; trophies for the best horses and equine exhibitions. It is combined with one of the largest feria and funfairs in Spain. The lights on the feria ground have more than a million bulbs. The event lasts a whole week and you will not find any accommodation in Jerez unless booked well in advance. Expect to pay more than double the normal rate for hotels. (We paid 257€ for one night in the Sherry Park Hotel, a four star and in our opinion, not worth half that amount). The feria ground covers more than 52,000 square metres of land and houses 216 casitas. This feria has been in existence since the times of Alfonso X the Wise and casitas have been used since the beginning of the 20th century. Formerly tents were set up for private parties and dancing. If ever you managed to see all the sights of Jerez and wanted to see the surrounding area then take the toll road towards Seville and at exit 45 turn off to Los Cabezas de San Juan. From here you can visit Espera and Arcos. You also have a wide selection of golf courses in the area.